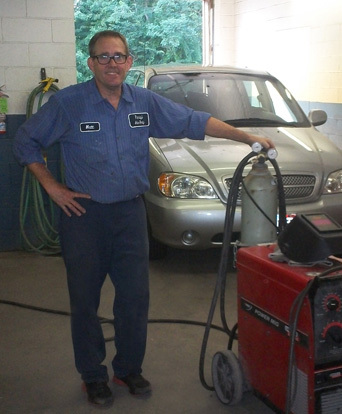 Matt Penney welcomes customers with welder and quality service. Our customers expect the highest quality in collision repair. That's what we are committed to…and it's what we deliver. The heart of Penney's is the well-designed and well-maintained workshops. The technicians take pride in working here, and this translates into quality workmanship. Penney's takes pride in its committment to protecting our environment. All excess materials are disposed of in strict compliance with EPA standards and specialized equipment is used to protect you - the customer. © 2019 Penney's Auto Body, Inc. All Rights Reserved.